For about a year now, I have increasingly found that there seems to be less time for physical activity. Sure, that's an excuse in itself. But whatever the reason, it feels like it's harder to get some exercise. I have been busier, there's no doubt. Yet even in my leisure time I am more likely to blog or play games and watch anime and the like. Such is the life of the otaku. When I started playing Guitar Hero and Frets on Fire, more and more I felt the desire to play DDR again. That's when I realized that this was the solution to my physical activity dilemma. 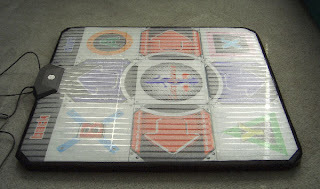 I could be playing a game, brush up on my DDR skillz for whenever other opportunities would present themselves (i.e. Animazement) and get this body in better shape at the same time! A winning combination all around. These days it doesn't take much to get dancin' DDR style. All you need is a pad, PS2-to-USB adapter, and StepMania. So you don't even have to buy the game anymore. 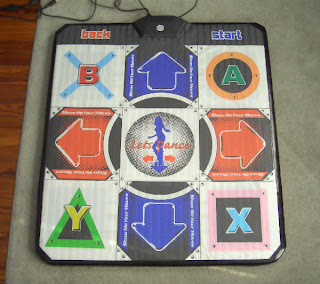 Now, I wanted to save a little more money, and found an additional alternative for your dance pad option. Normally, you'd want to get a good quality foam pad, which can cost about $90 or so. Buying an inexpensive soft pad is not a recommended choice. That is, unless you're up for a little DIY project. I found an excellent guide for modding your soft pad. My version is what you see pictured above, and it works very well. Though I did use slightly different materials at three parts of the guide. The plywood was a scrap piece I got for free, and I wanted to make sure I used plywood because it is stronger than particle board. The guide linked above uses particle board, but I was worried that it would crack during more vigorous dance sessions. The total price of the project comes in just under $90, which actually means that I didn't save as much money as I had hoped. Nevertheless, the project was quite fun and I am glad to have done it. The advantage to a modded soft pad such as this is that it's actually stronger than a foam pad for the same price. Also, if the pad itself ever wears out, I can take it apart and buy another soft pad to replace it with. That's much cheaper than having to replace the entire pad. My previous USB adapter that I was using for the guitar controller did not support dance pads, hence the additional cost there. So I had to spend a little extra money to get a proper adapter from Play-Asia. I went with the StepMania recommended choice, the Dual Shooter EMS USB2. Not only does it support pads, but also light guns, and it has two controller inputs. That means you can even do two pads or guitars for some multiplayer action. Since the completion of this project, I've been playing quite a lot. It feels good to get up and move! Now I just need to keep on practicing so I can hit those harder songs. Wish me luck!